Initially passive systems were developed to support in tracking and navigation for location-based applications. For the applications that require real time location information of the vehicle, these systems cannot be employed, because they store the location information in the internal storage that can only be accessed when vehicle is available. This is the main disadvantage of the existing method. The proposing method is aimed to track the vehicles and theft identification is done. Whenever anybody tries start the car by rotating the key the MEMS sensor gets disturbed and it automatically sends the alert message to mobile including latitude and longitude values of the location of the car being theft. Then the owner of the owner of the vehicle can stop the engine of the car by sending message to the car then the engine gets stopped automatically. It can be used to locate the position of the vehicle. The location of the vehicle is indicated using GPS (global positioning system) technology. Communication link is made possible through a GPS receiver. GPS will give the information of parameters like longitude, latitude and attitude. With this system we can easily identify vehicle thefts. Here the communication takes place between GPS receiver and GPS satellite. GPS satellite continuously tracks the missing vehicle and the position of the vehicle is send to the controller from GPS receiver. Vehicle position should be send to the GSM. Power supply unit: A 12 V transformer, bridge rectifier, filter and regulator is used in this section. IC7805 provides 5v supply to the circuit. 4KB of in system programmable flash program memory. GPS: GPS is used to track the position of theft vehicle. GPS transmits Longitude and Latitude information at 9600 baud rate. 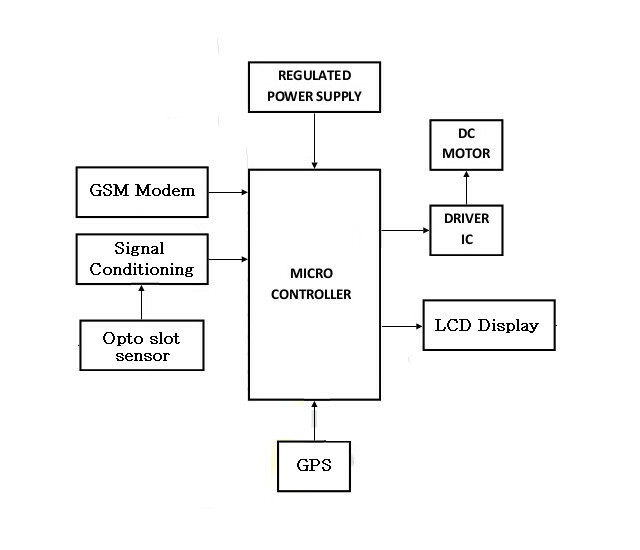 GSM: GSM Modem is used to send theft alert from vehicle and read SMS alert from user. Data transfer rate is 9600 baud rate. Opto slot sensor: The device is a simple isolating opto coupler. It is used to detect false key trigger input. Whenever an opaque object (KEY) is placed in between the slot, the transmitted IR signal is blocked which does not falls on the photodiode, thus the output of the opto slot goes to HIGH. LCD Display unit: 16X2 LCD is used here. Its function is to display status of each module and status of vehicle etc. Motor driver: This unit used for demonstrating ignition key of vehicle. It has a motor driver and a DC motor. 12V Relay is used to switch DC motor. Transistor BC547 is used to drive Relay. Datasheets and the user manuals of 8051.